Hurricane season beings June 1st . Is your home prepared? Hurricanes can produce winds of more than 155 miles per hour along with heavy rains and flying debris No one can forecast where and when storms will form, let alone if/where they might make landfall and what the impacts could be. Your home is one of your largest investments, so protecting it from natural disasters should be a top priority. Seasonal homeowners, do not be caught off-guard by hurricanes. Here is a handy list of things that you can take care of before the season starts. Review your insurance policies. Make sure you are adequately covered. Building costs are always on the rise, so you want to make sure you have enough to rebuild. Hurricanes have destroyed many homes in the past due to flooding. You may wish to consider purchasing flood insurance. Make sure that gutters are clear of debris and in good shape. Install head and foot bolts on entry doors to add extra protection against strong winds. Garage doors often blow in, and if you have an attic above that, they can also blow up and literally tear your house apart. Strengthen your existing garage door by installing a vertical garage door brace and reinforcing it with horizontal wooden beams. Make sure you arrange in advance someone such as G-Man Home Watch to install storm shutters on your home in the event of a predicted hurricane. Trim branches and shrubbery around the home. Make sure you are not creating missiles by leaving things lying around in your yard. Items that can be picked up by strong winds — your grill, lawn furniture, garden gnomes and other items — should be stored indoors or secured to the ground. 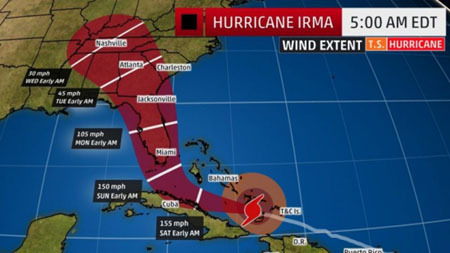 If you plan to be away during hurricane season, contact G-Man Home Watch and secure our services to help you maintain your home. If you stay past June 1 st you may begin to hear the terms “hurricane watch” and “hurricane warning” in your local forecast. Understanding the difference between them is essential to helping you prepare for a hurricane. A watch means hurricane conditions are possible within 48 hours. You should begin to stock up on emergency supplies in the event a warning is issued. Be prepared to evacuate, especially If you live in a coastal area. These are just some of the things you can do in preparation for hurricane season. Seasonal homeowners should have a home watch team on their side. Contact us for more information about our storm preparation services for season residents.